The recreational vehicle (RV) holiday is becoming more popular than ever amongst families, with eight out of ten Australians stating that a caravan holiday is a good option for families, according to Jayco’s most recent travel survey. The results showed that while most adults did not experience RV holidays as a child, the majority believe it would provide their family with more opportunities to spend quality time together. Over 70 per cent of those who supported the statement that caravan holidays are a good option for families, also said that it would provide them with more opportunities to show their children the Australian countryside. Jayco Marketing Director, Andrew Ryan, said that RV holidays are a perfect option for parents who want to have a memorable and interactive holiday with their children. “There is nothing quite like heading out on the open road with the kids. The songs, the driving games and all the random pit-stops simply cannot be replicated when you travel by air,” Mr Ryan said. Nearly two thirds of respondents (63 per cent) would consider caravanning around Australia rather than an overseas holiday. Of those who would prefer to caravan, 61 per cent said that a caravan holiday would allow them to holiday longer for less. The survey found that many of us (56 per cent) would consider purchasing a caravan over a holiday home and 64 per cent would consider it over hotel accommodation. Jayco, which holds 46 per cent of the RV market, says that caravan and motorhome sales continue to grow as the concept of the caravanning family holiday becomes more popular. “Families are starting to realise that going on a caravan holiday doesn’t mean sacrificing any of their creature comforts. “With air-conditioning, showers and television, many of our models are more luxurious than hotel rooms!” Mr Ryan said. *Jayco conducted an online survey amongst 1005 Australians using research company, Pure Profile, in July 2012. Australians have revealed they are itching to get out and see their own backyard instead of buying a holiday home, according to Jayco’s most recent travel survey. The survey asked 1005 Australians for their thoughts on recreational vehicle (RV) holidays and their travel habits. * The results showed that 56 per cent of us would rather rough it on the road in campervans, caravans and motorhomes than purchase a holiday home. Sixty two per cent of Australians said that buying a caravan was a much more cost efficient option than buying a holiday house, and just under 50 per cent would prefer an RV holiday because they can get out and meet new people on the road. Jayco Marketing Director, Andrew Ryan, said that RV holidays were becoming a more cost effective option for people wanting to get out and see more of Australia. “Modern day RVs are comfortable to live in, with all the proper amenities including running water, a fridge, microwave and depending on the model you have, a shower and toilet,” Mr Ryan continued. More than 63 per cent of Australians would consider buying a caravan instead of holidaying overseas. Of those who would prefer to caravan, 58 per cent said this was because they would like to see more of Australia, and 73 per cent adored the idea of packing up and going wherever you wanted, whenever you want. Penny pinching trended throughout the survey, with 63 per cent of Australians stating that the cost of hotel accommodation deters them from going on holidays, and 64 per cent said they would go on more holidays if they owned a caravan. The survey revealed that even though they’re cost conscious, Aussies are still spending on travel with more than 60 per cent of Australians spending between $1,000 and $2,500 per person when they go on holiday. Jayco, which holds 46 per cent of the RV market, says that RV sales have been steadily increasing since 2009, as the nation catches on to the caravan craze. “Sales in 2011 increased by 14 per cent. The young couple market in particular has continued to grow as more and more of us want to experience the relaxation and affordability that comes with an RV holiday. “An RV trip allows you to experience authentic Australia, meet new people and spend relaxing time outdoors with friends and relatives,” Mr Ryan concluded. Whether you are someone who can’t live without their toys or are a traveller who likes staying active on holidays, the 2012 Jayco Work ‘N Play is certain to impress with its massive storage garage and raft of new features. With the ability to store surf boards, dirt bikes, wave runners, fishing gear while still comfortably sleeping four people, the new 2012 14 foot Jayco Work ‘N Play is all about maximising on storage without skimping on style. This new smaller model has a lower towing weight than its 17 foot counterpart (1480KG tare compared to 1,830 KG tare); making the Work ‘N Play accessible to owners of smaller non-4WD cars such as the Holden Commodore Wagon. Across the entire Work ‘N Play range, travellers are bound to be impressed by the Work ‘N Play’s new interior which includes a choice of three Laminex bench tops, new furniture fabric designs and full height kitchen splashbacks that are bound to impress even the most discerning eye. Together with a range of standard features including Eurostyle furniture and large Thetford fridge, actionseekers can also choose from personalised options like external speakers, solar panels and air-conditioning. Jayco’s Marketing Director, Andrew Ryan, said that the 2012 Jayco Work ‘N Play is perfect for active bodies who like to take their lifestyle with them on the road. “The Work ‘N Play has been designed specifically for activity focused RV holidays and the 2012 updates will make those holidays even more enjoyable. “With the ability to store all of their various toys, customers will never have to compromise on fun when it comes to their RV holiday,” said Mr Ryan. They won’t have to compromise on quality either thanks to the Work ‘N Play’s tough exterior which includes a strong aluminium cladded vacuum bonded frame and a hot dipped galvanised chassis which is built for superior strength and protection against tough Australian conditions. The quality and innovation of the Work ‘N Play is evident right down to the RV’s tyres which have a nitrogen-based tyre pressurisation system designed to reduce wear and tear and running costs. Customers have the added protection of Jayco’s 12 month warranty and Roadside Assist Program which is provided free for three years, available 24 hours a day, 365 days a year. The 2012 Work ‘N Play is available at all Jayco dealers across Australia and New Zealand. For your nearest Jayco dealer call 1300 JAYCO RV or visit www.jayco.com.au. Leaving the white sandy beaches and tropical fish of Ningaloo Reef behind, it was back to the dusty outback to tick another magical destination off the bucket list - this time Millstream-Chichester National Park in the Pilbara. While the Pilbara is generally dry and arid, water flows year round in Millstream. The Millstream wetlands are fed by a natural underground reserve contained in the porous dolomite rock, which itself is fed by runoff from the Hamersley Ranges. It is believed to store 1700 million cubic metres of water - making the area a haven for plants and animals. We stocked up on supplies and fuel in Karratha then headed down the Karratha/Wittenoom Road. It provides safe passage through the steep terrain of the Chichester Ranges, and is sealed to Barowanna Hill. The road runs parallel to the Pilbara Railway that transports iron ore from Tom Price and Newman to Karratha Port for export. Occasionally the locomotives run past, weaving their way through the mountains with an endless trail of carriages in pursuit. Alternative access is available from the north via the Roebourne/Wittenoom Road or the west via Millstream/Pannawonica Road. We set up camp under a Millstream Palm at the delightful Crossing Pool Campground on the banks of the Fortescue River in the park's southwest. The camp used to be much bigger but with regular flooding was lost to the river. These days it is limited to about eight vehicles in undefined campsites under mature tree cover. It's a lovely peaceful spot with a gas barbecue, pit toilets and communal picnic table on a grassed plot. There are excellent bird watching opportunities and the river is suitable for swimming, paddle craft or fishing. Embankment ladders at all of the main swimming holes prevent injury from entering via the slippery banks. The 17km Snappy Gum scenic drive sweeps through vegetated scrublands featuring white-barked gums, pincushion spinifex and a proliferation of paperbarks along the river bank. A lookout provides spectacular vistas in every direction, particularly the tabletop mesas and the Hamersley Range in the distance. The drive links to the main Miliyanha Campground on the other side of the river, adjacent to the Millstream Homestead. It has 20 designated sites arranged in a circuit, with each tucked into the scrub, but offering little shade. There is a camp kitchen including a gas barbecue, toilets and both hot and cold running water. The homestead was formerly a pastoral station running 55,000 sheep but these days it serves as an unmanned visitor centre with plenty of information on the surrounding area. If needed, the ranger can be contacted using the intercom at the front counter. Camp hosts look after the camps in peak season, collecting fees and distributing information. From the homestead a walking circuit leads you on a tour of the grounds and into the bushland through scattered date palms, introduced by the early Afghan cameleers. A management plan is slowly removing them so the native Millstream Palm can again flourish. The walk leads to the magical Chinderwarriner Pool - carpeted with lily pads. 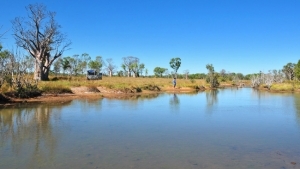 The pretty Murlamunyjunha Walk also links the two campgrounds, tracing the path of the Fortescue River. A couple of metal grills provide passage over the river as it narrows, leading to an erosion zone where the landscape shows dramatic damage from earlier floods. In the park's northeast a largely unsealed road winds its way to Mt Herbert where a number of walks depart in the same direction from the car park. They include the walk to McKenzie Spring (4.5km), Mt Herbert Summit (600m), the Chichester Range Camel Trail (8km) and the Cameleers Trail (4km). The signage isn't great, however all the walks skirt the base of Mt Herbert and divert off the path at designated spots. Back in the car and a few more kilometres down the road is the walk to Python Pool, a permanent plunge pool at the base of a tall escarpment and a great place to cool off in the warmer months. Simply follow the creek bed, stepping over the large boulders to get there. Snake Creek Campground is the final stop, although the facilities are limited to a pit toilet and a few clearings. Back on the road, we headed towards Carawine Gorge and, leaving Nullagine, a sign advised the track was open for 4WDs. But 46km down the road we were greeted with a 'Road Closed' sign at the Mt Olive Track junction. We backtracked to Nullagine and the local cop shop to report the inconsistency. After conferring with Main Roads they confirmed the road was closed. Bugger! Now we know that when touring on back roads it is a good idea to check the road status with local authorities or Main Roads before heading out. So we jumped back on Marble Bar Road and wound our way towards Marble Bar, Australia's hottest town, to see the sights and catch up on a shower at the local holiday park for the night. The price of diesel in the Pilbara makes for an interesting discussion. At the time of travelling, Exmouth on the main highway was asking $1.82 per litre. Further inland at the mining towns of Tom Price and Newman, diesel pumps out at only $1.68. But at Marble Bar it's back to $1.94, plus a 5% credit card fee to thank you for your custom. To save on fuel costs in Western Australia we subscribed online to Fuel Watch, a service provided by the Department of Commerce. Simply select your destinations, fuel type and preferred fuel vendor and an email pings your inbox each day with fuel prices. While not all destinations are supported, most are, and the information we got sent was accurate. It's a pity this service isn't offered in the other states. The next day it was off to Carawine Gorge, this time via the bitumen Ripon Hills Road. The way is littered with carcasses, as the speeding road trains are unable to stop for wandering stock along the unfenced plains. En route we came across our first really serious wide load, taking up the full width of the road. Fortunately, they were able to squeeze us through, a lead car warning upcoming traffic that we were there. Carawine Gorge is located on the Oakover River and accessed via a dirt track around 100km east of Marble Bar. It lies within Warrawagine Station however tourism access is managed by the Department of Environment and Conservation, and the site remains free to visit. We caught our first glimpse of marauding camels along this route, grazing in the distance. It wasn't to be our last, as approaching Carawine Gorge along the access track, we spotted a second group, who kindly posed for our photographs, before wandering off into the scrub. There are plenty of camping options at Carawine Gorge. Taking a right turn and following the wheel tracks at the old fuel drum will take you down to the popular grassed area along the gorge. There are some lovely shaded sites along this section suitable for tents and small camper trailers with views to the gorge and the pretty waterway. Otherwise you can plough on ahead at the fuel drum and find a spot along the gorge. We trekked our way to the end of the gorge over a sea of gravel and river rock to set up camp, backing up to an escarpment. We had the place to ourselves, giving us an evening of sheer serenity. The next day we followed the main road to the junction of Skull Springs Road, which we had endeavoured to reach from the Nullagine end, and here the road was clearly marked as closed. As it was nearing beer o'clock we opted to return to camp, put our feet up and stare out into the gorge and watch the sunset. A distant dingo howling broke the silence of an otherwise quiet evening. Heading north again past Marble Bar, we opted for another back road shortcut to Eighty Mile Beach, along the Muccan Shay Gap Road. A sign at the track entry provides a contact number for the local shire to check the road conditions and having learnt our lesson we made the call to confirm the road's status - open to 4WDs. The mining interests keep the road wide and in reasonable condition. Keep an eye and an ear open for road trains, as tourists are not expected along this route. Keeping the UHF radio in scan mode will generally warn you of their presence. The drive was quite pretty, running parallel to a mountain range not dissimilar to the Moralana Scenic Drive of the Flinders Ranges as it weaves and dips along its route. The last leg of the journey through Shay Gap and onto Boreline Road traverses a sandy track that for most parts is smooth travelling. We lobbed into the Eighty Mile Beach Caravan Park on the Foundation Day long weekend along with half of WA. The tide goes out a long way in these parts meaning a long walk to reach the water's edge, but the beaches are beautiful and worth the effort. As the sun set, we marvelled at our Pilbara adventure and pondered what the Kimberley would bring. With the summer holidays almost upon us, many travellers are making the necessary preparations such as booking caravan sites, buying supplies and preparing itineraries. However often forgotten –but just as important – is preparing your RV for the summer vacation. By following these simple tips from Australian largest RV manufacturer, Jayco, RV owners can hit the road with ultimate peace of mind. Put it through its paces. Perform a thorough RV inspection before you head off on your vacation to make sure everything is in working order. Check the lights, inspect all attachments and connections and make sure you get everything that is broken or worn-down repaired. Inflation. Underinflated tyres are more likely to puncture and reduce fuel efficiency, so check your RV’s tyre pressure before you hit the road. A few pounds per square inch (PSI) either way can make all the difference between a flat tyre and a trouble-free holiday. Service with a smile. Make sure you take your RV in for a service if it is due. Jayco recommends servicing your RV every 12 months. This will ensure your RV gives you years and many happy kilometres of trouble-free travel. Don’t pack the kitchen sink: While Jayco RVs are designed with maximum storage in mind, try to be vigilant and refrain from packing large, heavy items that you are unlikely to use. Extra weight burns extra fuel so the lighter your load, the fuller your wallet will be at the end of your holiday. Make sure you have back-up. It may sound obvious, but make sure you’re covered for roadside assistance and ensure that your existing membership hasn’t lapsed. Jayco Roadside Assistance will provide you with 24 hour support in the event of an emergency such as emergency towing, flat tyres, lost keys and accommodation. 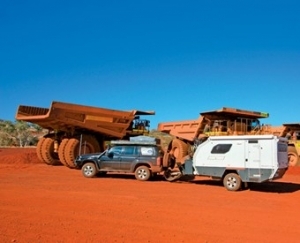 For more information on Jayco Roadside Assist visit http://www.jayco.com.au. The track had vanished for the second time in the past half hour, but this time it looked as if it was gone for good. I pushed the Nissan into the hunched fronds of the spear grass, the once-proud three-metre-high stalks now bent by time, the dry season and the wind into a metre-high mass of jumbled rotting vegetation. Suddenly, a fence line presented and while the ‘moving map’ on the Hema Navigator had predicted such an object, its instantaneous appearance still startled us a little. I swung the wheel hard left and we then bumped our way along beside it. A gateway loomed, its entry and exit virtually hidden by the mass of grass and low scrub that had grown up since the last vehicle had passed through here. We were heading for the NT/WA border near the northern coast of Australia and a long way from anywhere. When we got to a stream about a kilometre later, its waters tamed by the dry season into long shallow pools and trickles in between, we wandered the banks looking for any sign of the track. There wasn’t any, even though the GPS said we were close – and even right on it at times. Conflicting thoughts battled in my head; should we go on or turn back? I really wanted to continue, but we were on our own and not really set up for such an undertaking. I had staked a tyre on a cattle grid the previous day, leaving us only one spare; food (and beer) were short, and the trip to the coast could take another day or more, even though it was so tantalisingly close. We chickened out and turned back. What do they say about saving the fight for another day? Our travels north of Kununurra, in the far north of WA, had started a couple of days previously as we headed out of town and drove this way and back on the crisscross of roads that cut across the irrigation area north of the town. Phase Two of the Ord River Irrigation Area is now well under way with the land being prepared for irrigation and cutting up into farm blocks. Crossing the border, we left all the development behind, although the irrigation system will reach out this far when it’s completed. Just before the Keep River crossing 9km further on and well north of the national park of the same name, we turned onto a little-used track and headed north. A small creek which normally has water flowing in it well into the dry season is crossed shortly afterwards and then about 10km north a number of tracks lead off to the left a short distance to the high banks of the Keep River. A few spindly trees cast a minimal amount of shade while rough-hewn steps make access easier to the water. We set up camp for the night. Here the river is generally fresh because rock bars a short distance downstream help keep the salt incursions to a minimum and it is still a long way to the mouth. Crocs though – freshies and estuarine – dot the exposed rocks in the middle of the river, making swimming an absolute no-no. Still, those with a small tinnie could launch it from around here, but you’d need to pay attention to the rock bars that stretch across the stream and are easily visible at low tide. Shortly afterwards on the track north another deeper creek is crossed, but luckily it has a solid rock bottom and, unless the water is deep and fast-flowing, it shouldn’t be too much of an issue. By following the large almost-right-angled bend of the Keep River, the track heads east passing several old station ruins before swinging north. Along here the river is mainly salt and greatly affected by the tide – but for those searching for barra and other big fish, the camps along here are some of the most popular. It’s still a fair haul from the river’s mouth, though. The track network north from here becomes a lot less used as large areas of salt-wracked flood plain begin to dominate the landscape. These plains might only flood during spring tides or when the Keep is in full spat but, even so, narrow soft channels wend their way across the plains waiting to trap the unwary. Well west of the river on a grassy plain we passed among magical boabs and the occasional kapok and kurrajong tree, the track narrow and little used, before we came to yet another boggy creek crossing. After that the track disappeared, for the first time, but we pushed on – the border looking ridiculously close and easy to get to. We were wrong. Turning around we headed back to the river and a campsite, tried our luck at a bit of fishing but the tides were wrong, while “You should have been here last week” was the only really relevant advice we received. No doubt we’ll return, possibly for the fishing, but certainly for the adventure of actually reaching the border. Heavy on features, but light on the wallet, Jayco’s new 2012 Starcraft range is set to continue its success from 2011 due to a variety of impressive additions and updates. The 2012 range boasts seven versatile floor plans for the caravan and four for the pop top. This gives holidaymakers an abundance of options which belies the Starcraft’s budget-friendly price-tag. The caravan has been updated with a strong emphasis on style and functionality. Building on its 2011 aesthetics, the 2012 range features newly styled cupboard door handles, comfortable Enduro foam furniture and fashionable curved finishes to the caravan’s Eurostyle cupboards and doors. Travellers will sleep soundly thanks to orthopaedic slats under the double beds which have the ability to extend by 150mm for extra room. Culinary travellers are also in for a treat with a new and improved Dometic three-way RM2553 fridge and a four burner gas grill in the pop top and four burner oven in the caravan. Jayco’s Marketing Director, Andrew Ryan, says that the Starcraft is ideal for budget conscious travellers who still appreciate the good things in life. “We had fantastic sales and feedback for the 2011 Starcraft range; that being said, we think that the 2012 Starcraft delivers even more bang for your buck. “When you look at what the Starcraft delivers compared to similarly priced new and used models, there is really no comparison,” said Mr Ryan. Jayco’s Starcraft caravan range also boasts impressive external features which are all testament to Jayco’s unyielding commitment to quality. All Starcraft caravans and pop tops come with Jayco’s durable Endurance Chassis which is galvanised for added protection, and an upgraded external trunk door that gives travellers access to even more storage space. All Jayco RVs are built in Australia and come with a three year roadside assist program and 12 month warranty. Head to the www.jayco.com.au to check out the brochure and experience what holidays could be like in a new Jayco Starcraft. Jayco has announced the release of the 2012 Conquest Motorhome range which is filled with exciting updates at every turn. Available in low and high roof models and in a range of innovative layouts, the new Conquest range delivers outstanding value for money, style and functionality. The Conquest now boasts a new fibreglass nose which provides the motorhome with improved aerodynamics and more storage space. The 2012 Conquest’s exterior also includes colour coordinated trunk doors, double glazed Dometic windows and new eye-catching graphics emblazoned on the motorhome’s side. While those who like to dine alfresco will appreciate the slide out gas bottles, slide out generator and double external power point that will make enjoying the great outdoors even easier. Internally the Conquest has received a makeover with a larger shower room, larger fridge and larger aluminium bed frame. The new Conquest doesn’t scrimp on safety; it now features a rear-view mirror mounted reversing camera – perfect for parking in tight camp sites. Updates have been made to the decor, such as new Baldacci cupboard door handles and the addition of internal cab blinds in lieu of a cab surround curtain. Jayco’s Motorhome Manager, Bruce Astbury, said the 2012 Conquest range is evidence of Jayco’s long lasting commitment to producing the best looking and most innovative motorhomes on the market. “Even though the 2011 Conquest range was hugely popular; we didn’t want to rest on our laurels. We are always looking to push the boundaries. “With the 2012 Conquest we believe we have produced a magnificent motorhome that packs a punch with its outstanding features while still offering customers great value for money,” Mr Astbury said. The 2012 Conquest range is available at all Jayco dealers across Australia and New Zealand. For your nearest Jayco Dealer call 1300 JAYCO RV or visit www.jayco.com.au. After two years of increasing sales for the industry-leading Sterling Caravan, Jayco has made a raft of upgrades that are certain to delight holidaymakers and caravan enthusiasts alike. Available in a range of new and modified layouts, the 2012 Jayco Sterling range brings even greater levels of style and comfort thanks to its unique layouts and furnishings. 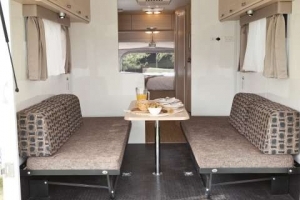 As well as the fantastic electric slide out bed and lounge feature which is available in a number of layouts, caravanners will also be impressed with additions to the Sterling’s interior which include a new curved kitchen design which incorporates curved seats, sink, drawers and a table. The Sterling offers travellers a new and improved Thetford swivel toilet, patented aluminium furniture construction and an upgraded 150 litre fridge. Holidaymakers will also enjoy new standard additions including a Coast to Coast washing machine and high quality Dometic windows with built in blinds. Externally, Jayco has upgraded the Sterling’s wheels, graphics and offers a provision for external BBQ installation, as well as a range of other improvements to ensure the Sterling is entrenched as the leader in the caravan market. Jayco Marketing Director, Andrew Ryan, said that the entire team at Jayco is proud of the improvements made to the 2012 Sterling Caravan range. “We believe Jayco has reached a new standard in design and comfort in the 2012 Sterling range,” Mr Ryan said. “Both internally and externally, the 2012 Sterling range exudes quality, attention to detail and functionality. We think customers are really going to appreciate the upgrades. “Jayco is committed to continual improvement of its product range and the 2012 Sterling is certainly testament to this,” said Mr Ryan. In 2012, travellers who purchase the new Sterling will have the added protection of Jayco’s Roadside Assist Program which is provided free for three years. Available 24 hours a day, 365 days a year, help from Jayco is always just a phone call away. The 2012 Sterling range is available at all Jayco dealers across Australia and New Zealand. For your nearest Jayco Dealer call 1300 JAYCO RV or visit www.jayco.com.au. With that in mind, the family RV company, Jayco, provides handy tips for keeping the kids entertained while on your well deserved RV holiday. Pack wisely. Kids love their creature comforts, so make sure you pack your RV full of the kids’favourite toys, bikes, DVDs and books. A great option is to choose an RV with extra storage, such as the Jayco Expanda, which enables you to fit all of their holiday gear with minimal fuss. Surf the net before you hit the road. Research your holiday destination to find out whether the caravan site is ‘child-friendly.’ By spending a little time on Google, you can find out where all the playgrounds, cafes and activities are at your holiday destination. Let the kids help. Don’t underestimate how much children can actually help you on your travels. Make them feel valued and important by asking to help you pack the RV, hold the map or cook dinner. Sometimes the simplest every day adult tasks are the most enjoyable for kids. Hook up your gadgets. Just because you’re in an RV it doesn’t mean you have to forsake all technology (especially with kids on board). Most caravan sites have the option of electricity connections which will enable you to connect a TV, computer or microwave. 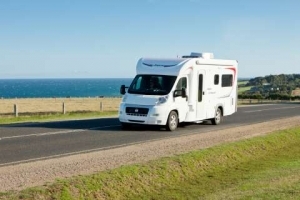 Coast to Coast (www.coastrv.com.au) has a great range of products designed specifically for RVs. Remember to take breaks. When on the road, remember to take pit-stops. Not only will this help you avoid dangerous driver fatigue but it will also give the kids a chance to stretch their legs and grab something to eat. A fifteen minute break can avoid hours of complaining. The social network: During the summer holidays, caravan parks are choc-full of other families and their children. Introduce yourself to other parents at the park and bring your kids along, they will love meeting new friends to play with. With the Christmas holidays fast approaching, everyone is weighing up their summer holiday plans and one option that is gaining more and more popularity is the classic RV holiday. A recent survey conducted by Jayco revealed that over half the population (54 percent) said they’d consider buying a caravan for family holidays, rather than using traditional hotel accommodation. What that in mind, it is not surprising that Jayco’s Expanda and Camper Trailer ranges are proving to be popular choices for modern families and holidaymakers. Jayco Marketing Director, Andrew Ryan, said that the Expanda Caravan range is the ideal RV for growing families who love the great outdoors. “The 17 foot layout which includes a shower, large parents’ front bed and a triple fold bunk, has been well received along with the more luxurious layouts that are popular with larger families,” said Andrew. “The Expanda is ideal for the summer holidays because they’re compact, great value and easy to tow, but families will also enjoy how the Expanda provides extra storage space for all their holiday gear,” said Andrew. With over 1,500 sales in the last year, the Expanda continually proves it is the perfect RV for a family friendly holiday. Jayco’s Camper Trailer range also remains popular with Australian families thanks to new updates to both the Touring and Outback models. The Jayco Camper Trailer range has eight different layouts to choose from and an assortment of new optional extras to enhance your summer holiday caravan experience. These include BBQs, bike racks, roof racks and the convenient electric winch which – rather than the manual wind up system, lifts the roof with a simple press of a button. “Thanks to their fantastic new additions and optional extras, Jayco Camper Trailers are perfect for any type of RV holiday and any type of traveller,” said Andrew. Your summer holiday may be fleeting, but both the Expanda and Camper Trailer ranges are built to withstand years upon years of vacations. This is largely thanks to Jayco’s ultra durable Endurance Chassis which independent testers have described the ‘clever chassis’ due to its strength and protection Jayco travellers also have the added protection and support of Jayco’s three year Roadside Assistance, 12 month manufacturer’s warranty and a lifetime warranty on the camper trailer winch to the original purchaser. So these summer holidays forget about airport queues, dodgy motels and inflexible travel itineraries; and say hello to the great outdoors, freedom and Jayco’s Expanda and Camper Trailers. For your nearest Jayco Dealer call 1300 JAYCO RV or visit www.jayco.com.au. One of Australia’s most advanced adventure 4 X 4 motorhome builders has selected Narva Extreme Driving Lights as standard equipment to meet the demands of harsh outback driving conditions. SLR Caravans & Motorhomes, a Gold Coast based private family business established in 1970 and building outback motorhomes for more than 10 years, made the selection following exhaustive trials on a range of alternatives. “Our vehicles carry up to six of these lights and we selected the Narva Extreme due to their rugged construction, strength and design features,” said Director, Stuart Boswerger. ”Both Halogen and High Intensity Discharge (H.I.D) Extremes are being used and our clients are amazed at the light performance and strength especially on corrugated outback roads and off road terrain out west,” he said. The company has been using Narva lights as original equipment for a number of years on the rear and interior and is now also fitting the latest L.E.D light bars for general purpose flood lighting. These special purpose expedition 4 X 4 vehicles, based on the Isuzu MPS300 chassis, are designed as all terrain multi-purpose vehicles capable of allowing enterprising local and international visitors to experience Big Red, the Simpson Desert and other outback locations. The company’s clients include many Australian retirees seeking the real Australian outback as well as international adventure seekers also keen to experience the wonders of the outback in comfort and safety. In conjunction with the Jayco Almost Summer Sale running from 15 to 24 September, Jayco is launching its 2011 Swift Camper Trailer series. Available in Touring and Outback models, the lightweight Jayco Swift Camper Trailer has been designed with small car owners in mind. 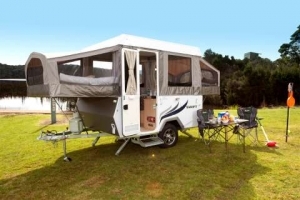 Holidaymakers will enjoy settling down for the night, or a sneaky afternoon nap, in the larger 4’6 front bed, while those with an eye for detail will appreciate the personalised front and rear mouldings, eye catching graphics and varying tent colours. The Swift Camper Trailer features a full height sink in a spacious kitchen, with a Dometic RM2350 fridge that is perfect for housing all of your holiday meals and snacks. Jayco Marketing Director, Andrew Ryan, said that Jayco is committed to providing caravan and trailer options for small car owners. “With that in mind, we are extremely proud of the new Jayco Swift Camper Trailer, we think it will be very popular as a compact value-for-money Camper,” said Andrew. As with all Jayco models, sturdiness and cutting edge design are key elements of the Swift Camper Trailer which features the famous galvanised Endurance Chassis which independent testers have lauded for its strength and protection. Like all Jayco RVs, the Jayco Swift Camper Trailer frame is made of aluminium with vacuum bonded fibreglass walls, which is 150 percent thicker than aluminium cladding and virtually hail and dent resistant. Travellers will also have the added protection and support of Jayco’s three year Roadside Assistance and 12 month manufacturer’s warranty. The 2011 Jayco Swift Camper Trailer is available at all Jayco dealers across Australia and New Zealand. Jayco has announced the release of the hugely popular Conquest Tour Edition Motorhome. Previously only available on the caravan and camping show circuit which recently took place across Australia, the Tour Edition Motorhome will become part of Jayco’s standard product range available through its network of dealerships. The new 2011 Conquest Tour Edition is exclusively available on the Fiat Conquest FD 23-1 and FD 23-3, and offers travellers great value for money with around $7,000 worth of savings on added interior and exterior upgrades. Jayco’s Motorhome Manager, Bruce Astbury, said the company is excited to offer the unique product to RV enthusiasts and says the model stood out from the pack during recent caravan shows. “We have designed the Conquest Tour Edition for customers who are passionate about the RV lifestyle and it has already proven to be a favourite amongst caravan show attendees,” Mr Astbury said. The Fiat Ducato is equipped with an automated manual gearbox and a 3.0 high performance turbo diesel engine, which guarantees drivers plenty of power on the road. The vehicle has a towing capacity of 1.5 tonnes which means it's able to tow bikes, boats and any other toys for all active pursuits. The motorhome boasts Dometic double glazed windows for added privacy, as well as alloy sport rims, interior leather upholstery and a stylish silver exterior finish. The model has an updated range of decor styles, with Eurostyle finishings such as Italian inspired door handles, a choice of tile and timber floor vinyl design, and a new style sink with a larger bowl for added home-like comfort. Fitted with LED lighting ensuring optimum power usage, the vehicle also includes bonus extras such as external storage doors, electric steps and a Carefree Freedom Electric Box Awning, offering great value for money. Mr Astbury said that the motorhome is cutting edge in terms of RV design. “We pride ourselves on build quality and design innovation, which can be seen in the Conquest’s onepiece integrated fibreglass cab surround, and the five layered vacuum bonded frame for greater insulation and strength. The fully insulated floor provides a barrier from road noise and cold temperatures,” Mr Astbury said. “All Jayco RVs are manufactured with tough-frame, vacuum-bonded fibreglass, which is 150 percent thicker than aluminium cladding and is virtually hail and dent resistant. Mr Astbury said that the 2011 Conquest Tour Edition will be the same price as the Standard FD 23-1 Conquest. “We’re offering visitors great value with this fantastic model,” Mr Astbury said. Hot off the heels of the 2011 Jayco Sterling Caravan range launch, comes the release of the new Double Slide Out Sterling Caravan. The innovative Double Slide Out Sterling brings even greater levels of style and comfort thanks to its unique design and layout. At the push of a button, both the bed and the dinette can expand or contract, providing extra room to move when you arrive at your desired location. As well as the fantastic slide out feature, holidaymakers will also be impressed with the additions to the Sterling Slide Out’s interior which includes the choice of five stylish leather upholstery colours, patented aluminium furniture construction and a 150 litre fridge to stock all of your holiday culinary treats. The Sterling Slide Out also includes Italian styled door handles, a new square vanity basin in the ensuite and energy efficient LED lighting. While the updates to the Sterling Slide Out Caravan offer holidaymakers new levels of comfort, the caravan still maintains a solid exterior. The Sterling’s unique Tough Frame is a combination of a strong aluminium frame bonded with ply and a fibreglass skin, which gives owners peace of mind knowing their caravan is robustly built and virtually hail and dent resistant. As with all Jayco products, the Sterling’s chassis is hot dipped galvanized for long life, strength and protection. It’s no wonder independent testers have described it as ‘the clever chassis’. Jayco Marketing Director, Andrew Ryan, said that Jayco is extremely excited about the release of the Sterling Double Slide Out Caravan. “Packed with features, the 2011 Sterling Double Slide Out is certain to become one of Jayco’s most popular caravans. “We were one of the first Australian companies to introduce the electric slide out function and we have seen a rise in the number of orders for the slide out feature in other models,” Mr Ryan said. In another boon for RV owners, Jayco is now offering three years Road Side Assistance and a 12 month warranty, providing you with added protection for longer while on the road. The Sterling Double Slide Out is available at all Jayco dealers across Australia and New Zealand. Heading off on an RV break over Easter? Tens of thousands of Australian families take their caravans on the road on the Easter break to explore our great country. With the ANZAC day holiday included in this year’s mix making for a longer break, it will be important to think of ways to keep the kids amused. There’s no vehicle with better nooks and crannies to hide easter eggs than a caravan. Send the kids outside to run around while you hide the eggs in all the clever storage compartments and fold-away spaces. Just make sure the kids know that they have to tidy it all back up after they’ve finished pulling it apart! Kids love to cook, and what better than to help them barbeque a fish they caught themselves on Easter Friday? If you don’t already have fishing gear, you can buy a reel, bait and tackle fairly inexpensively from the local game shop – throw a line in at the local river or beach and wait to see what happens. (If you don’t have any luck, make sure you make it to the local fish or supermarket before it closes!). Fillet the fish, add some olive oil, lemon, salt and pepper and throw straight on your RV’s fold out barbeque. There’s nothing better than the taste of fresh fish on Easter Friday, and it’s an experience your kids will remember for a lifetime! Make your kids useful and teach them how to read a map. They’ll love the thrill and the responsibility of telling you where to go next. Letting them navigate will also help to take up the time between journeys, and it will be more pleasant than listening to the automatic voice of your sat-nav. For rainy days, there’s a certain thrill in cosying up in the RV as a family and watching a movie. Coast to Coast sells a variety of RV-entertainment options, including 19” and 22” Sphere LCD TVs with inbuilt DVD players, with prices starting from $575.00. Also available are a range of speakers, antennas and satellite systems, to make it seem like you’ve never left your living room! Most caravans and RVs come with the option of bike racks on the back. Depending on your model of van, you can purchase racks from Coast to Coast which will easily fasten onto the back of your vehicle, starting from around $380.00. For the true adventure seeking families, Jayco also offers a range of Toy Hauler models which come with an inbuilt garage which can store motorbikes, jetskis, go karts and more! Most importantly, wherever you go and whatever you see, make sure to make the trip safe, fun and fulfilling. Happy Easter! Jayco’s camper trailers include all the standard features you’d expect for a fun family holiday, with a modern and sleek finish. The updated door design of the camper trailer features an insulated resin transfer moulded top door and fibreglass bottom door, giving the van a modern feel. A new, innovative roof with interlocking design adds strength and style. Jayco Marketing Director, Andrew Ryan, said that the camper trailer remains the recreational vehicle of choice for Australian families, and believed that the new range would not disappoint. “The old style roof has been relatively unchanged for 35 years, so this innovation is a huge advancement,” Mr Ryan said. Both the Outback and Touring models are the result of extensive research and development from the dedicated design team at Jayco’s headquarters in Victoria. Jayco’s Outback Range has its own unique look and feel, with front and rear mouldings and updated graphics. This tougher version allows you to venture throughout Australia’s vast network of unsealed roads, freeing you up to explore some of the country’s most incredible hideaways. 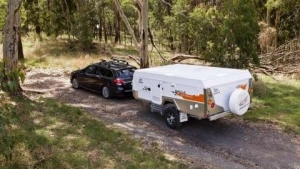 “The added strength of Jayco’s Outback camper trailer offers families the extra flexibility to go further into the countryside than ever before,” Mr Ryan said. As with any Jayco, there is also a great range of extra options available for added convenience and comfort. The 2011 range includes external barbeques, bike racks and roof racks. A new and exciting optional extra is the electric winch - which conveniently lifts the roof with the push of a button, rather than winding it up by hand. Both models include a range of updated features such as a new front and rear design, as well as a contemporary interior finish and choice of five new decor colours, with each model defined by their own graphics, front and rear styling and tent colour. Getting ready for your annual RV trip and not quite sure that you’ve crossed everything off the list? Take a look at Jayco’s suggestions for a hiccup–free holiday. Choose the right van. Planning an RV holiday but haven’t purchased the vehicle? Make sure you do the research so you get the RV that meets your needs. Jayco makes a range of RVs that cover families, couples, adventurers and retirees. Think about your towing capacity, your budget, where you will store the vehicle and how much room you require for additional guests or equipment. Research the destination. There’s a bunch of ways to find out about excellent RV destinations. Travel shows, such as Making Tracks which airs on Channel 10 at 4.30pm on Saturdays, provide a great run down of places to visit while caravanning, and the people you can meet along the way. Don’t get stranded. As with any vehicle, make sure you’re covered for roadside assistance. RV Care Roadside Assistance will provide you with 24 hour support in the event of an emergency. RV Care can help with things such as emergency towing, flat tyres, lost keys and accommodation, and membership costs less than $100 per year. Get connected. Just because you’re away from home doesn’t mean you have to cut yourself off from civilization (unless you want to). Set up your own wireless network on your van so you can google as you go. Save on energy. The environmentally aware will be pleased to know that you can power much of your van with solar panels, negating the need to hook up to electricity at a caravan park. Coast to Coast provides a range of excellent caravan accessories, including solar panels – visit www.coastrv.com.au. Safety test. Give your van a test run before you hit the road. Hitch the unit to the car, check the safety catch is operating and attach safety chains. Check all lights. Make sure towing mirrors are correctly fitted and adjusted so that you are constantly aware of all other traffic on the road. And most essentially, make sure all gas bottles are switched off before you depart. Check the roads. If you’re travelling anywhere in northern Australia during the wet season, make sure to call ahead to find out if conditions are suitable for RVs as often roads can become flooded and dangerous. Down south, be sure to stay aware of bushfires – the local State Emergency Service will be able to provide you with any updated information about fires in the area. Sparkle and shine. Make your van the envy of all others on the road by giving it a polish inside and out. There are a range of RV cleaning products available from Camco which can be purchased at www.coastrv.com.au. Record your journey. RV holidays can be the trip of a lifetime. Whether travelling with family, friends or on your own, remember to take photos, video or write a blog, so you can share your trip with others for years to come. Jayco Australia has its own Facebook page, so get online and tell other RV enthusiasts about your trip. Find like minded friends. Got a taste for the RV lifestyle? You might not be surprised to know that there are many others out there just like you. To ensure that your RV road trip becomes more of a regular occurrence than just a summer jaunt, join a Jayco Owners Club. There is at least one club in each state around Australia, and they hold monthly or bi-monthly rallies to a variety of destinations. 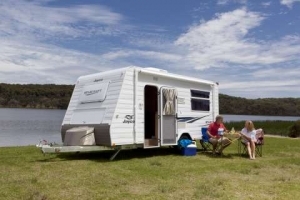 New South Wales regions have topped the list of the ten most popular caravan and camping holiday destinations during 2008, according to the latest Caravan or Camping in Australia 2008 Snapshot released by Tourism Research Australia. Topping the list was the South Coast of NSW which accounted for 2.7 million visitor nights, followed in second and third positions by the Mid-North Coast and Northern Rivers regions with 2.5 million and 1.7 million visitor nights respectively. The Murray region also made the list in ninth place with 1.1 million visitor nights spent in the region in 2008(+). 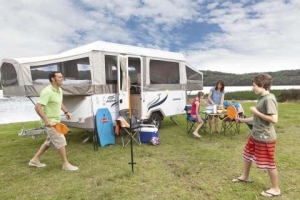 During the year ending 31 March 2009, 27 million domestic visitor nights were spent in a caravan park or commercial campground nationally with around 34%, or 9,317,000 domestic visitor nights, spent in NSW(*). Barry Baillie, CEO of the Caravan and Camping Industry Association of NSW (CCIA) says that the caravan and camping sector has seen the emergence of ‘first time campers’ entering the market. Domestic visitors travelling with a caravan and staying in a caravan park accounted for the greatest number of domestic visitor nights across Australia in 2008 (30%) followed closely by those staying in a cabin in a caravan park (22%). “The quality and luxury of today’s caravans and other recreational vehicles is outstanding with many including bathrooms, kitchen facilities, living areas and spacious sleeping areas,” Mr Baillie commented. 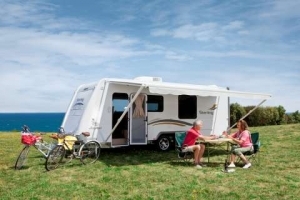 "For caravan and camping holiday ideas, travellers can visit our website - www.caravan-camping.com.au." (+)Caravan and Camping Snapshot 2008. Tourism Research Australia. Includes those staying in a caravan park or commercial campground and caravan and camping on private property.